Petit Collage’s new pop-out and color sets have an added twist that sets them apart from their previously released pop-out sets — kids can now color the characters and the scene themselves. 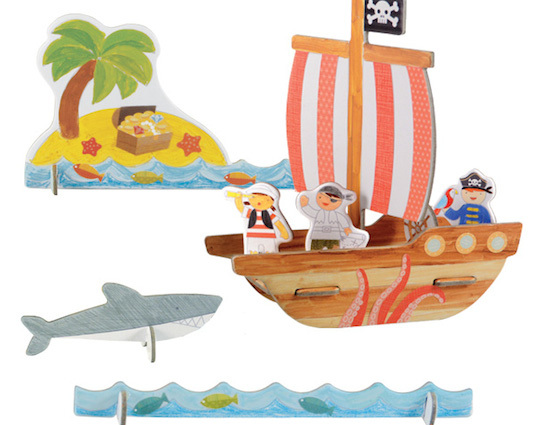 Available in a pirate or castle theme, each set encourages little hands to punch out the shapes, design and decorate the various pieces, and assemble the set (and then, of course, comes playtime itself!) Both sets come with five colored pencils and a sheet of stickers and are printed with vegetable inks on recycled paper. We’re going to stock up on both for a rainy day or “What do we do now?” activity. Petit Collage�s new pop-out and color sets have an added twist that sets them apart from their previously released pop-out sets -- kids can now color the characters and the scene themselves. Available in a pirate or castle theme, each set encourages little hands to punch out the shapes, design and decorate the various pieces, and assemble the set (and then, of course, comes playtime itself!) Both sets come with five colored pencils and a sheet of stickers and are printed with vegetable inks on recycled paper. We�re going to stock up on both for a rainy day or �What do we do now?� activity.